Spring quarter is in full swing at UCI and it’s the perfect time to take part in a few of our 50th Anniversary festivities. This Saturday, thousands of students, faculty, staff and friends will come to campus for Celebrate UCI, our annual open house, car show and student-run festival in Aldrich Park. On Saturday, May 9, the Eater Nation will head out to Angel Stadium of Anaheim for a special UCI Night featuring the presentation of colors by our Army ROTC Color Guard, a UCI Village, and post-game fireworks. You can find me on the mound, throwing out the first pitch. No promises I’ll be as good as the Angels’ Jered Weaver, but Peter the Anteater has been giving me a few tips. Last month, I was officially invested as UCI’s sixth chancellor. If you were unable to attend the ceremony, I invite you to read my full remarks or watch the investiture webcast. I am grateful for the privilege of being part of the Anteater family, a truly inspirational community of scholars, teachers, learners, and supporters who are determined to serve humankind. I have heard your high hopes for our future. While there is tremendous pride in what we have done to date, there is also an eagerness to do more: make even stronger contributions in research, education, and service; accelerate our ascendency among globally preeminent research universities; and marshal our passions, skills, and ingenuity to further improve people’s lives. As UCI moves forward, our future success relies on our ability to foster new and existing partnerships, innovate new programs and ideas, and expand the campus. Collaborating with others makes us better and enhances the impact of our work. These relationships are absolutely essential to drive transformative innovation and growth throughout our community. UCI has a legacy of conducting trailblazing research that shapes the way we look at and study the world. In fact, UCI was the first university in the nation to create a department of Earth system science. Last summer, a team of esteemed UCI glaciologists and students participated in an expedition to Greenland’s North Atlantic fjords to map and track the melt rate of glaciers. Led by Eric Rignot, professor of Earth system science and senior research scientist at NASA’s Jet Propulsion Laboratory, the team spent two grueling weeks using a “multi-beam” sonar device to record the depth and formations of glaciers. Their important work, which may be used in future policy-making, will help researchers across the globe better understand how ice sheets are melting. It is with great sadness that I share the news of the passing of Jack W. Peltason, emeritus chancellor of UCI and emeritus president of the University of California. He died March 21 at the age of 91. Jack was an inspiration to me when I was a graduate student studying politics and law. One of the great privileges of coming to UCI was getting to know him, and benefitting from his wisdom, advice, and good humor. 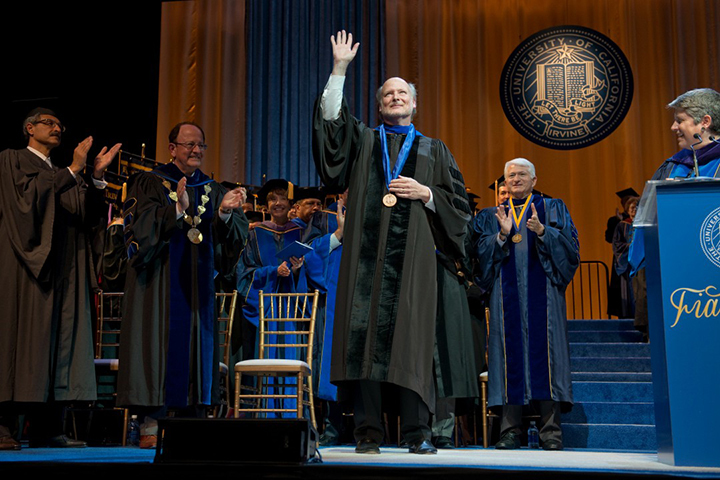 Jack was a great visionary and compassionate leader of our campus, and a force in American higher education. His loss is deeply felt by all who had the privilege of knowing him and by all who have benefitted from his contributions to the Anteater community. Our sincerest condolences go out to Jack’s wife, Suzanne; children, Nancy, Timothy and Jill; seven grandchildren; and eight great-grandchildren. April is Autism Awareness Month. At UCI, we work together with community partners to improve the quality of life for families, children, and young adults with autism spectrum disorders. One example is our involvement in the Center for Autism & Neurodevelopmental Disorders, a joint effort among UCI’s School of Medicine, CHOC Children’s, Chapman University, the William & Nancy Thompson Family Foundation, and Children & Families Commission of Orange County. The center offers educational classes, family support groups, clinical services, evaluations, and therapy, and engages in national research projects that provide a pathway to new forms of treatment. Thanks to a $1.5 million gift from the Dharma Civilization Foundation and donors Irma and Ushakant Thakkar, the School of Humanities has established the Thakkar Family DCF Endowed Chair in Indic Religious and Civilizational Studies. This endowed chair will be held by a respected scholar with expertise in the study of Dharma traditions and classical Hindu teachings, texts, and practices. Last summer, Vahe and Armine Meghrouni pledged $1 million toward the establishment of an endowed chair in Armenian Studies. The generous support from the Dharma Civilization Foundation, Thakkar family and Meghrouni family will elevate UCI’s place as a global research university and ensure the study of rich histories and traditions continue to thrive in the School of Humanities. Stem cell researcher Leslie Thompson has been awarded $5 million by the California Institute for Regenerative Medicine to continue her work on developing treatments for Huntington’s disease. Thompson and her team have identified a highly promising neural stem cell line that shows disease-modifying activity in mice with Huntington’s disease. Dr. Dan Cooper, chair of the UC Irvine Health Department of Pediatrics, was recently named Pediatrician of the Year by the Orange County chapter of the American Academy of Pediatrics, an honor bestowed to pediatricians who have made outstanding contributions in their field. 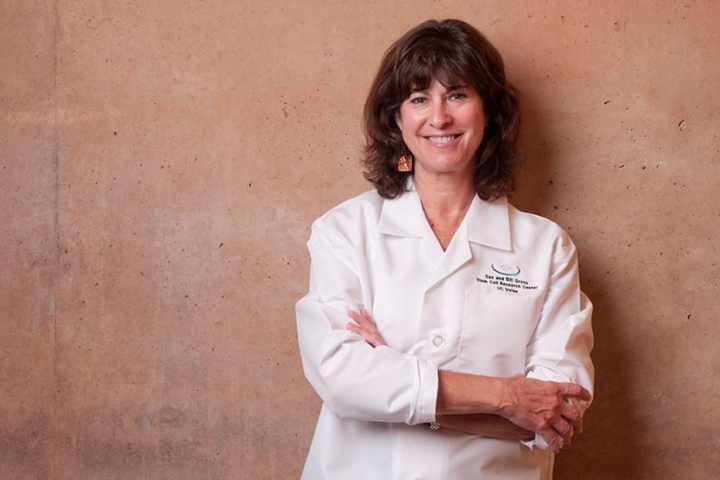 Cooper is an esteemed researcher with a focus in childhood exercise, obesity, and diabetes. He also leads UCI’s Institute for Clinical & Translational Science, which is supported by a $20 million grant from the National Institute of Health. Henry Samueli School of Engineering Dean Gregory Washington was elected vice chair of the Engineering Deans Council Executive Board of the American Society of Engineering Education. In this leadership role, Washington will play an essential part in setting the standards for engineering education across the United States. We congratulate him on this tremendous accomplishment. I am happy to announce the launch of two new initiatives – UCI OCEANS and UCI’s Family Violence Initiative. Directed by Adam Martiny, an associate professor of Earth system science who specializes in ocean plankton, UCI OCEANS will strengthen bonds between the university and the public through focusing on ocean issues. 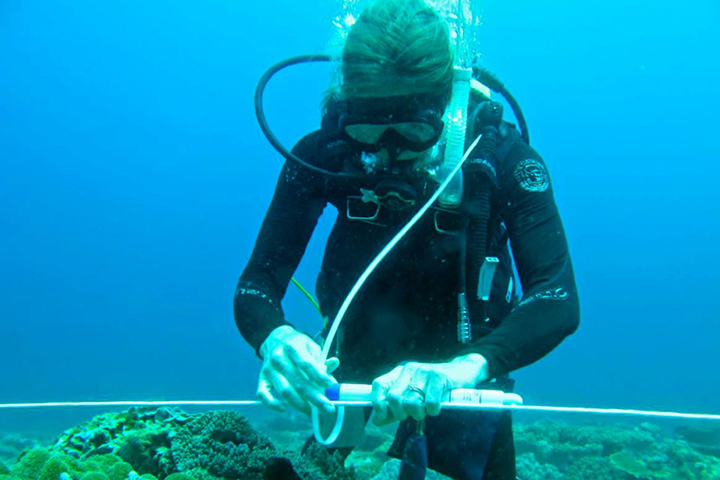 The initiative will include important scientific research, hands-on K-12 educational programs at local beaches, and science cruises for community members interested in collecting data for research projects. Our Family Violence Initiative, led by professor of nursing science Ellen Olshansky, will take a multifaceted approach to the study of family violence. Faculty will work closely with our Interdisciplinary Center on Family Violence to provide research, education, clinical care, and community collaboration on family violence prevention and intervention. More than 30 faculty members from 13 academic units will participate in the initiative. Orange County is the epicenter of water polo in this country. It’s only fitting that in addition to having two of the best water polo teams in their leagues, UCI also conducts some of the best research in the sport. 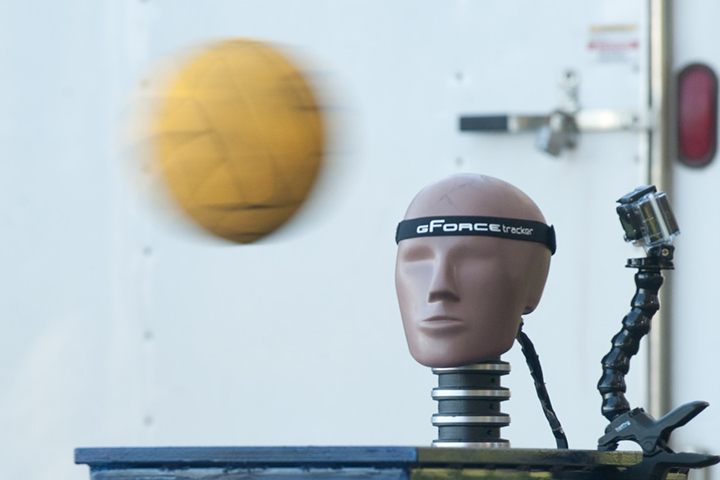 James Hicks, associate vice chancellor for research and director of UCI’s Exercise Medicine & Sports Science Initiative, is studying the prevalence of concussions and head impact injuries in water polo. With the help of UCI men’s and women’s water polo teams and USA Water Polo, his study will be the first real data set of its kind in the sport. Here at UCI, we’re fortunate enough to have the most feared, revered, and beloved mascot in the land – Peter the Anteater. Recently, late-night talk show host Conan O’Brien visited the campus to meet the legend and learn what it takes to be an Anteater. I think we can all agree that Anteaters are the clear victors in the mascot showdown. In fact, Peter the Anteater was named champion of Mashable’s NCAA Mascot Madness bracket.